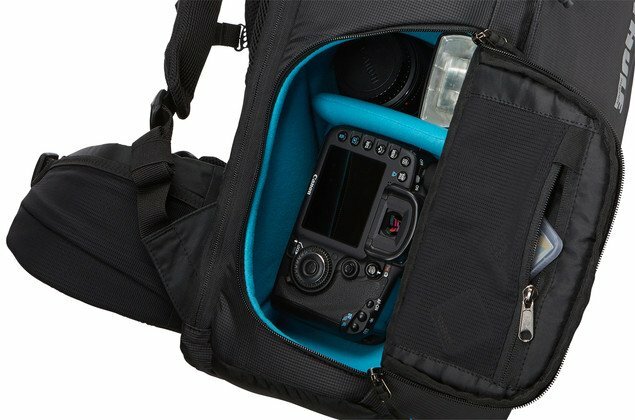 Finding a DSLR bag is easy. Locating one with a laptop sleeve is much, much more difficult. Add the need to stow a few clothes and toiletries for a weekend away, or a short business trip, and it starts to get impossible. Which is why TravGear got pretty excited when we saw the Thule Aspect video. Not least because a massive Cannon zoom lens has also comes into our lives. Could our existing go-to DSLR camera bag take its 400mm hulk? Absolutely not. But the Thule Aspect did. And then some. Measuring 30 x 22 x 52 cm and weighing 1.4 kg, the Aspect has a ‘secret’ side pocket just behind the back-panel that can take a laptop sizing 29 x 5.9 x 29 c (our 11-inch MacBook Air was fine), and a standard iPad Air, too (in a special pocket). The main compartment is opened from the side, and has well as a main channel to put a zoom lens attached to our DSLR, there are enough foldable, bendable and Velcro-able dividers to create hutches and homes for all kinds of lenses and gear. We love how everything feels very secure and safe, but at the same time is easy to access. The zip tags help with that, too. There’s even room on the front for a slip-zipped pocket that isn’t really needed. More vital by far is the top compartment, which has a few stretch fabric pockets and a zipped compartment, but is otherwise ideal for stowing a layer or two. Perhaps some lunch. However it is important to put something in here to counter-balance the weight down below, especially if you’re packing some heavy duty lenses. As well as the stylish Thule-esque finish to the Nylon material, the outside hosts a stretch fabric pocket for a tripod – complete with securing straps – and a good, strong carry handle. In fact, the only thing we’re really missing here is an additional stretch fabric pocket for a water bottle, which could go on the lid of the lower lens compartment. Lastly comes the padded back and padded, curved backpack straps, which on us was at its stable, secure best when the chest stop was fastened. Thule hasn’t cut any corners here, fitting the Aspect with hip belt that (a) has stretch fabric pockets, which is great for stowing a lens cover, but that’s (b) completely removable! That proved really handy for an exhibition hall, where a hip belt would have been a bit too outdoorsy. Worn out on a hike, then away on a three-day conference/photography trip, the Aspect proved adept, and that laptop sleeve … what a truly great idea. And whisper it, but you wear Thule and you do feel like you’ve got some secret knowledge about the very best travel brands … OK, that’s our job at TravGear, but a good discovery always feels great.